Cyclists are often subjected to many of the same roads and regulations as drivers, yet their vehicles are ill-equipped to handle many of the same road conditions. 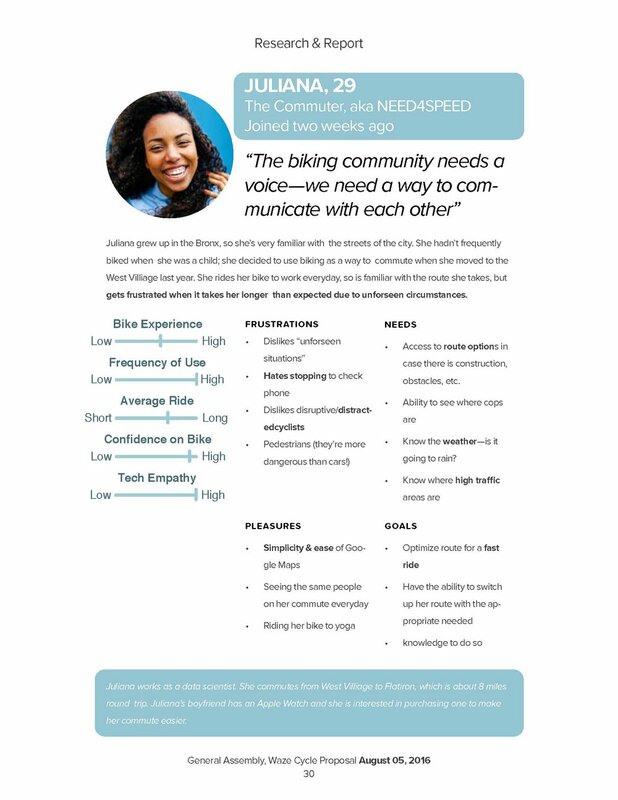 Existing cycling apps focus primarily on athletic performance or ride-sharing but not navigation. Those apps which do offer cyclists navigation fail at highlighting road construction or conditions in detail. Using Waze's platform, we have the opportunity to create a real-time GPS system for commuter cyclists while prioritizing bike lanes and reporting real time potholes, construction sites and dangerous intersections. 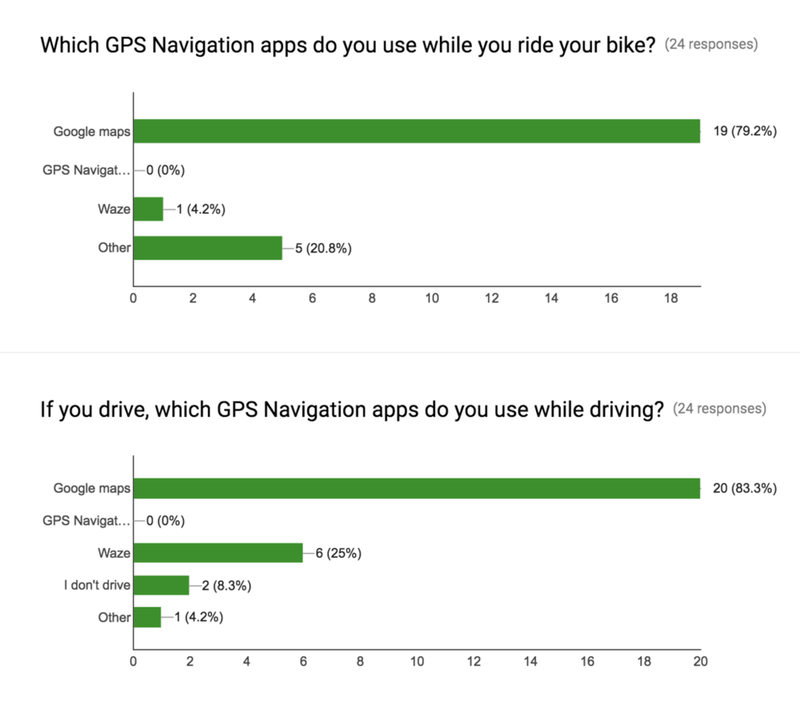 By evaluating top rated cycling and navigation apps, we developed a better understanding of the competitive landscape. We wanted to know why these apps were top rated and how they're used by actual users. In order to ensure the user has a seamless experience, we created user flows from similar mobile apps. Our goal was ensuring the app had the least amount of steps necessary to accomplish user tasks such as mapping a route. 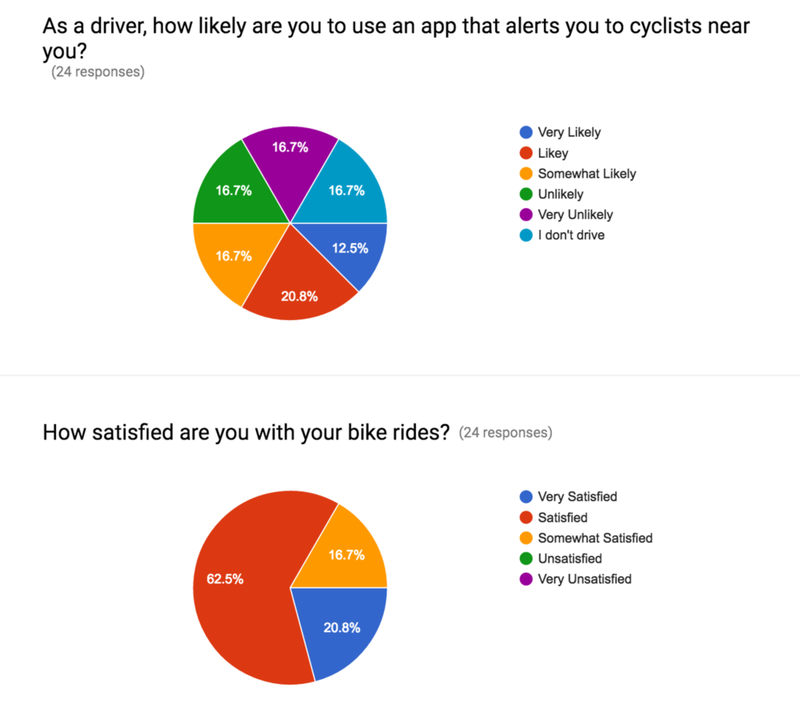 Google maps was by far the most-used apps by cyclists that responded to our survey and the favorite of every user we interviewed. 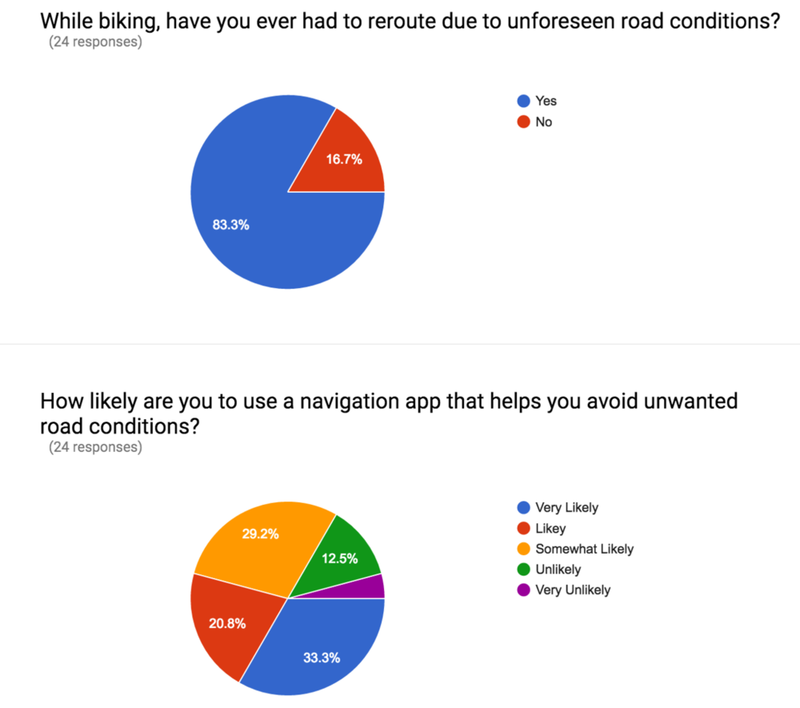 This insight led us to prioritize google maps control-mapping over waze's, in an effort to make the app easily learnable. 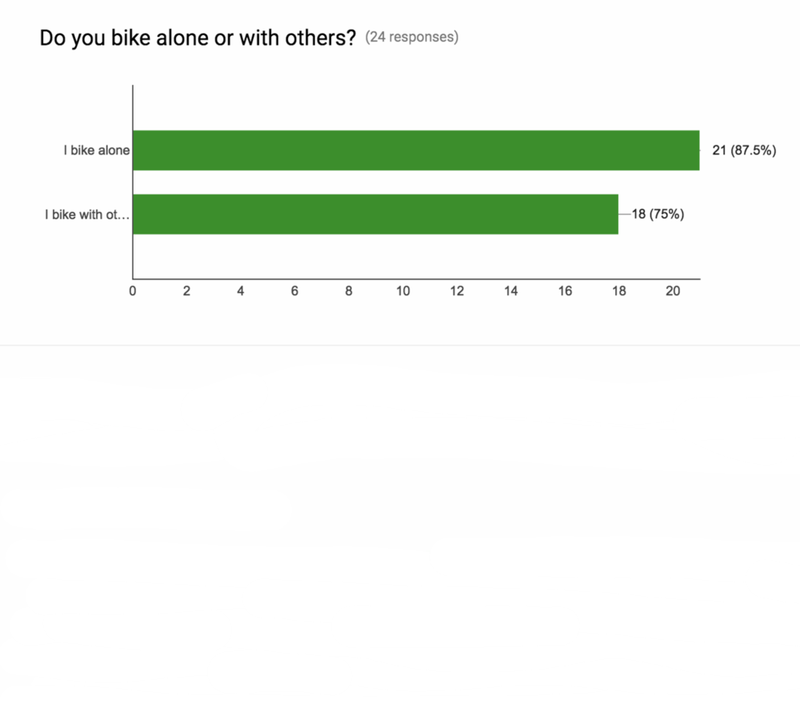 We surveyed 24 people and interviewed 8, with a distribution of commuters and recreational cyclists. We knew that our primary users were commuters. 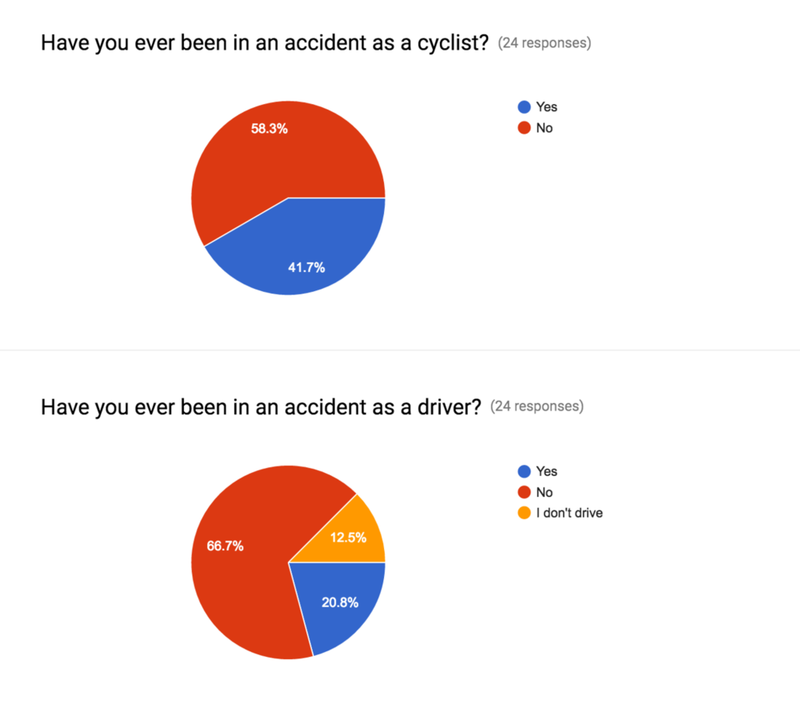 We wanted to better understand the context around cycling and their use of GPS navigation. Below are highlights of generative data gathered from our initial screener survey (left) which greatly impacted our design efforts. After synthesizing data, we crafted personas to better visualize the user and empathize with their needs, wants, and pain points. We crafted 3 personas based on 24 survey responses and 8 user interviews. Insights from affinity mapping helped determine which features to include in this Waze app. After having done competitive business analysis and interviewing a few users, we had a clear sense of the kinds of features were both desired and expected from a product like Cycle by Waze. We utilized two feature prioritization methods in order to develop an MVP (minimum viable product). Cycle by Waze is a sister-app to Waze. It should highlight ideal bike routes over street routes by default. Cyclists all expressed frustration with unforeseen obstacles on their regular routes. Waze reporting can mitigate the frustration by providing alternate routes. 2x2 Matrix plot used for feature prioritization along an axis of user impact vs expectation. Reporting the lane obstructions and seeing an overview of the route (including reported obstructions) were by far the most valuable features we could provide to users. 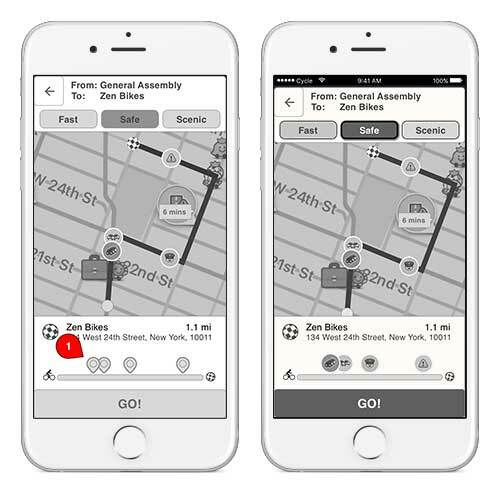 Waze exists as an independent navigation app designed for drivers and/or passenger use. We wanted to provide a unique user experience to cyclists using the app. It was a lot of work, but we started from scratch. We tested our low fidelity prototypes with 5 users to review the functionality of the app before spending time on high fidelity mock ups. We tested navigation at first, making sure users can find their way around the app, and gradually tested various functionalities with each iteration. (Left to right) Low fidelity wire frames in order of increasing fidelity toward visual design.